About two years ago, I started experimenting with SUCCULENT PROPAGATION. 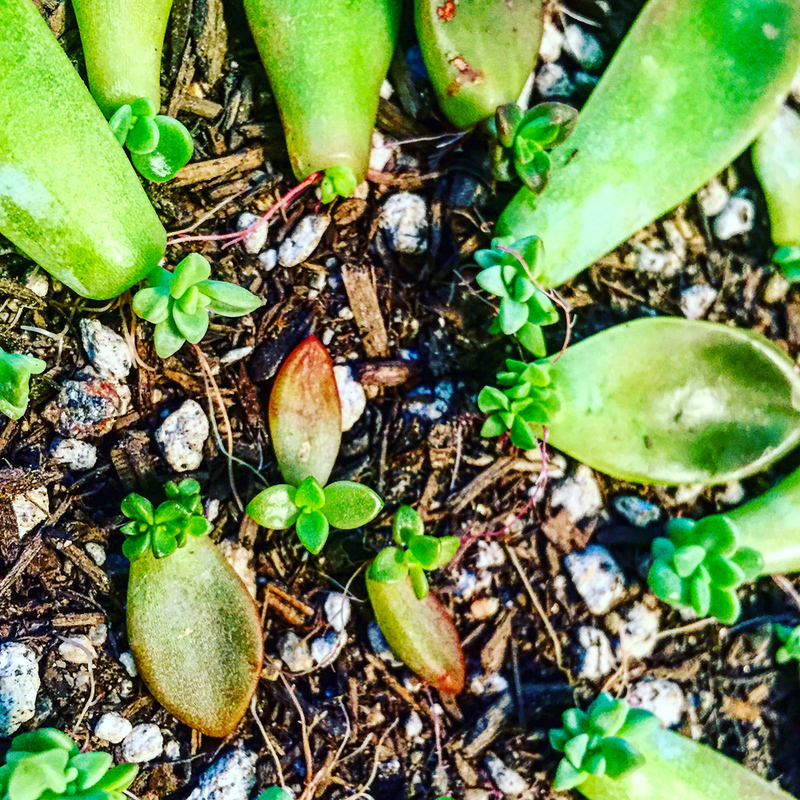 The approach I was going to take was through leaf propagation, in which you grow baby succulents via healthy succulent leaf clippings (please note this works only for certain types of succulents). As I set up my succulent "nursery", wandering amongst my plants collecting the plumpest and healthiest looking leaves, I wondered what the best method would be for me to try to grow my leaf babes. In which I cultivate my most plump and ready looking leaves and keep them in an indoor situation (with bright & indirect light, or in the case of my home, the bottom of my bathtub) misting every 3-5 days. In which I allow some leaves to remain within leaf clutter and mist whenever I remember. In which I lay leaves in sheltered outdoor area and mist every 3-5 days. While I was going around setting up and monitoring my little leaf babes, I was struck by the similarities I found within my propagation styles and parenting approaches. My "cultivated" approach was like that helicopter parent, always trying to control all the situations. My free range approach was like the backlash to helicopter parenting, free-range parenting, in which children (of a certain age of course) are encouraged to explore their world independently and with less adult supervision. And my hybrid approach was like the most of us parents out there - keeping a close eye while (at times desperately) trying to set up a great environment for growth. While many of my leaves successfully grew roots and baby plants, I found that they quickly lost their cute round and chubby look, and instead became elongated and thin. Meaning there wasn’t enough light for them there. I could have gotten a grow light, to resolve this issue, but I kind of wanted my bathtub back anyway 😉. Far fewer of my leaves successfully grew roots or babes (many of which just got biodegraded back into the soil) but those that did grow grew well! The babes were chubby and round, the roots were long and thick and these babes were tough! I had almost the same result with this approach as I did with my free range approach - fewer leaves actually turned into new plants, but those that did were strong and adorable! Based on my findings - I decided to buy a couple of cheap plastic greenhouse (off Amazon - for those who are interested) - covered it up with a sheet, stuck it on the side of my house and that is now my "succulent nursery". I should state that I live in San Diego area, so we can keep plants of all types outdoors pretty much all year round. Parenting is my greatest joy and fear all at once. It's the deepest love combined with this primal instinct to protect these little beings with all my might, all while feeling like I could always be doing it just a little bit better. Being a parent is also extremely anxiety inducing - I mean there is so much out of your control that could possibly happen at any single moment. How can you protect anyone from things unknown and out of your control? Obviously, you can’t. Playing with my succulents helped me to move past much of this anxiety and even let go of the need to control. I realized that no matter how optimally I set things up for success, sometimes stuff just happens. That it’s okay to let go of those things no longer helping, to move forward and GROW. Of course, raising a well-rounded, considerate, empathetic human being is WAY WAY more challenging than raising succulents, Yet, while working on raising up my kiddos and my plant babes simultaneously, these resilient, amazing, independent and unique plants (and my amazing, independent and unique kiddos) taught me that no matter what our approach where there is LOVE and CARE there is GROWTH. And the same can be said for all for us.